Building snowmen is one of the highlights of winter. 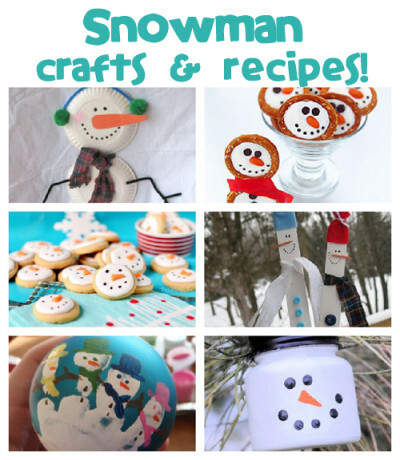 Bring the fun indoors with snowman crafts and recipes! These symbols of winter are fun for all ages. We here at Fun Family Crafts have gathered tons of snowman crafts and recipes for the young (and the young at heart!). 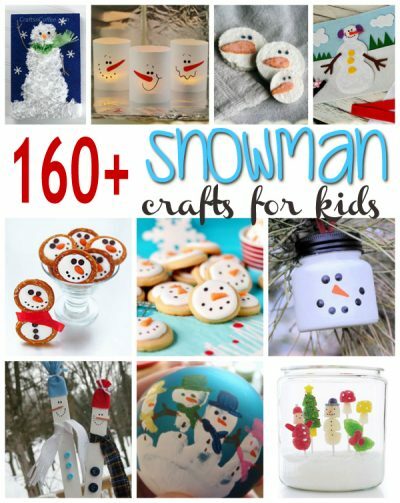 Below we’ve chosen ten of our favorite snowman crafts, but you can see them all here. 1. Plastic Bag Snowman Picture – Turn empty plastic bags into a delightful, dimensional snowman! This is a great way to reuse plastic bags that are torn and can no longer hold anything. 2. 3-Minute Paper Snowman Luminaries – Create illuminated snowmen to decorate for winter with this simple 3-minute craft. It couldn’t be easier! 3. Snowman Soap Experiment – Who would guess that these adorable snowmen started out as a bar of soap?! This fun project combines science and art, a winning combination. 4. Snowman Felt Board – Mix and match to make lots of friendly snowmen with this fun felt project. Felt scraps are perfect for creating a variety of hats, scarves, and other accessories. 5. Frosty Snowmen Pretzels – These darling pretzel snowmen treats couldn’t be cuter! And with the combination of salty and sweet, they’re just as delicious as can be. 6. Snowman Cookies – These tasty cookies are really quite easy to make. They are a fun treat to make and serve throughout the winter. 7. Easy Snowman Ornament – Turn an empty baby food jar into a snowman ornament for the tree. This fun recycling project is quick and easy to do. 8. Paint Stick Snowmen – Give used paint sticks a new life by transforming them into festive snowmen. This project is inexpensive, fast and easy. 9. Handprint Snowman Ball Ornament – Create a keepsake you’ll treasure for years to come with this snowman handprint ornament. This makes a wonderful gift for grandparents or other special friends and family members. 10. Holiday Gumdrop Pops – Gumdrops become a beautiful (and edible!) winter scene with this fun craft. Let your creativity shine!